Son of a government official. In 1814 his family moved to Paris. He was educated at the Collège Louis-le-Grand and the Collège Charlemagne. At school he became friends Gérard de Nerval, a friendship that would last al ltheir lives. He studied with Rioult to become a painter, but De Nerval introduced him to Victor Hugo, who stimulated his interest in literature. As early as 1826 he had started writing poetry and in 1830 he started attending the meetings of Le Petit Cénacle, an artist group consisting of De Nerval, Alexandre Dumas père, Alphonse Brot and others. He wrote on art and culture for La Presse and other journals and travelled to Spain, Italy, Russia, Egypt and other countries. In 1835 he introduced the l'art pour l'art principe in the novel "Mademoiselle de Maupin", claiming in the preface that 'everything useful is ugly'. For the Romantic Ballet he wrote "Giselle", first interpreted by the ballerina Carotta Grissi. She was his great love, but she wasn't able to return his love and he married her sister, the opera singer Ernesta. They had two daughters, Estelle and Judith, the future lover of Richard Wagner. He was a member of the Club des Hashischins in Paris. This was a society that explored the taking of drugs and existed from 1844 until 1849. Baudelaire, De Nerval, Delacroix and Dumas were also members. From 1851 until 1856 he was director of the Revue de Paris. In 1856 he became the editor of L'Artiste, using his editorials to describe his art for art's sake principles. He was a famous men during the 1860s and in 1862 he became the chairman of the Société Nationale des Beaux-Arts. However, the Académie Française rejected him three times as a member. In 1866 he parted with Ernestina Grisi. In 1868 he was offered the position of librarian by princess Mathilde Bonaparte. During the Franco-Prussian War he was in Paris and after a long period of suffering from heart problems he died at Neuilly. 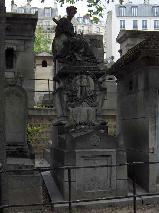 The grave of Théofile Gautier at Montmartre Cimetière, Paris.